A Cygnet of Things to Come — Will Smaller Formats be the Swan Song of Bombers? Designing new packaging formats for beer was how I cut my teeth in this industry, going back more than 12 years to when I was working on secondary packaging innovation for Miller Lite. In those days, ideas were cheap. Except when those ideas increased the cost of cardboard by a single penny, which had an impact of millions of dollars across their system. You can imagine the pearl-clutching. Beer packaging tends to follow two distinct paths. There’s the marketing gimmick, like the 99-pack from Austin Beerworks, or the cold-activated bottles from Coors, or the Vortex bottle of Miller Lite. And then there’s occasion formats. Those bottles, cans, and other containers that enable a new kind of use case with the beer: the growler and crowler, the shift to 16-oz. Packtech 4-packs, the Guinness widget, etc. Perhaps no single format has had more of an impact on craft beer in the last 15 years than the bomber. It revolutionized price points (very good for brewers), reduced packaging costs (also very good for brewers), and accelerated the sharing occasion (very good for nerdy drinkers). The bomber was a boom for craft brewers, especially those like Chicago’s Pipeworks, who based their entire early business model on the constantly rotating shelf sets of those broad-shouldered bottles. The constant newness and limited releases ensured most excited consumers worried about FOMO wouldn’t do the math—at least not for awhile. Now that those bombers are becoming a log-jam on the shelf (indeed, entire aisles at large liquor stores have long been buckling under the weight of the dusty things), brewers are looking to new formats designed to balance price-point with packaging costs, all in an effort to find a new customer, or a new occasion with existing customers. Off Color is betting on small being the new big thing. Or at least their new thing. After working through the installation of a new $150K+ bottling line, they’re ditching their wine-esque 750-mL bottles for much smaller and personal-pan-pizza-sized 8.5-oz bottles sold in 4-packs. Compared to those 750s, the 4-pack taken together will be substantially more volume (25% more) and the price-point will be much more competitive ($14-16 vs. ~$20+). In the case of Cygnet, that will amount to about a 40% savings for consumers. But for Off Color, there’s a lot more sacrifice than the margin on volume. The packaging costs of four labeled bottles and a carrier replacing a single 750-ml bottle are substantial. Material costs are more than double. But in a brewery this small, the percentage increase across their product and packaging isn’t as critical as the absolute costs. For breweries of this size, this is basically the marketing budget. The willingness to spend so much on packaging materials, and bringing prices into the 4-pack specialty realm for a beer that used to sell for $20 in a 750-ml bottle is an indication of just how jammed-up the shelf has become for large format. But that shift alone won’t make the difference. This new format needs to find its way to new customers and occasions for a net gain. And like the 15-pack Lager trends of 2017-18, finding new drinkers for whom the convenience and accessibility of the product is paramount to purchasing is the new end-game. Brewers need to expand the audience. And that audience needs to be met where they’re at. But what I find curious about Off Color’s shift to this smaller, more accessible format is that this isn’t a down-market move. They also wanted to capture the elegance and brand cues that co-founder John Laffler preferred in the 750s. The small, slender bottle profile he prefers, he explains, are only made in Germany by a single glass producer a few times a year, which means for now, he’s crossing his fingers that they’ll become more popular, and by extension, more in-demand, available, and cheaper. 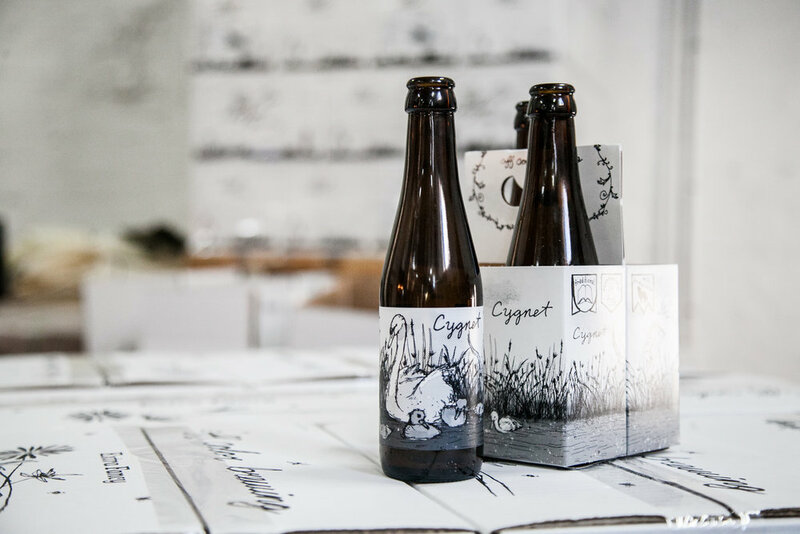 For a beer like Cygnet, a Jester King collab that combines the koji fungus addition in a sake base (which cause the enzymatic reaction necessary for brewing sake), blended with a base Saison mash and aged in a foeder for a year, Laffler is relying on that unique bottle profile to hint at the sophistication of the beer in the bottle, much the way the 750s did. Off Color holds back a portion of its barrel- and foeder-aged bottles from each release for later on-premise sales in the taproom. This creates a special attraction to the cellar list, but also demands an ambitious drinker if you’re on your own, or with a friend, rather than a group. But these new 8.5-oz bottles will make trial and exploration of that list far more enjoyable for an individual. On a personal note, as a middle-aged parent, I often look forward to a single beer when I get home from work. And these days, I feel like I’m mentally counting backwards the number of beers I have left in my life to enjoy (hello, darkness, my old friend). The idea that I can enjoy 8.5 ounces of a foeder-aged sake Saison blend with the same carefree enjoyment of a Pale Ale is an awfully attractive one.